If you never love a horse, you will never understand..."
Our American Miniature Horses breeding facility is located in the beautiful Betuwe area situated opposite "De Linge" river. On this special location we carefully breed a special kind of horse. When we started our breeding program we carefully selected only the best horses to import from the USA. We continue to import new horses every now and then to keep our bloodlines up to date. We only select horses from the best breeding facilities during our yearly visits to the USA. In most cases we fly with our horses ourselves from Houston International Airport to their new home at our farm. We are very proud to say that during the years many champions were born at our farm! 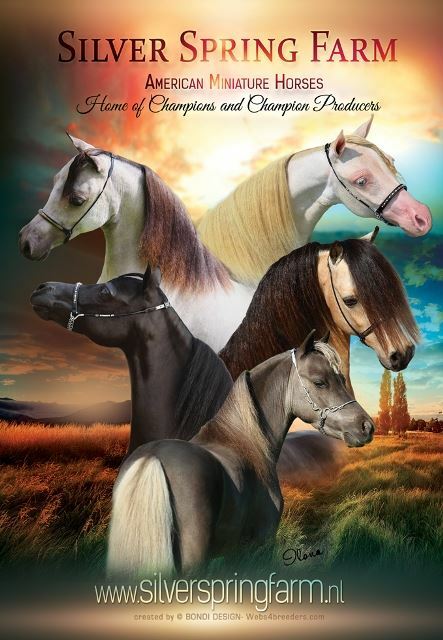 All our horses are AMHA (American Miniature Horse Association), AMHR (American Miniature Horse Registration) and NMPRS (Nederlands Minipaarden Registratie Stamboek) registered; they are also all DNA tested and Parentage Qualified. Besides a breeding facility Silver Spring Farm is an approved SBB (former Aequor) practical training facility and I am Assessor for the Wellant Colleges. If you would like to know more about us, please feel free to make an appointment to visit our special farm!